Here at Avanti we have implemented our HCM solutions for hundreds of customers, and we see our customers have the greatest implementation success when they invest the time to put a change management plan in place. Recently, Karman Gill, CPHR Candidate, and I spoke to a group of HR Technology students at SAIT. We discussed why change management is important to achieve digital transformation for HR, and to provide some best practices for putting a change management plan in place to ensure Human Capital Management (HCM) Implementation success. We thought this was a good time to share, to help you as you look forward to new additions or solutions your organization will be taking on in the next year. 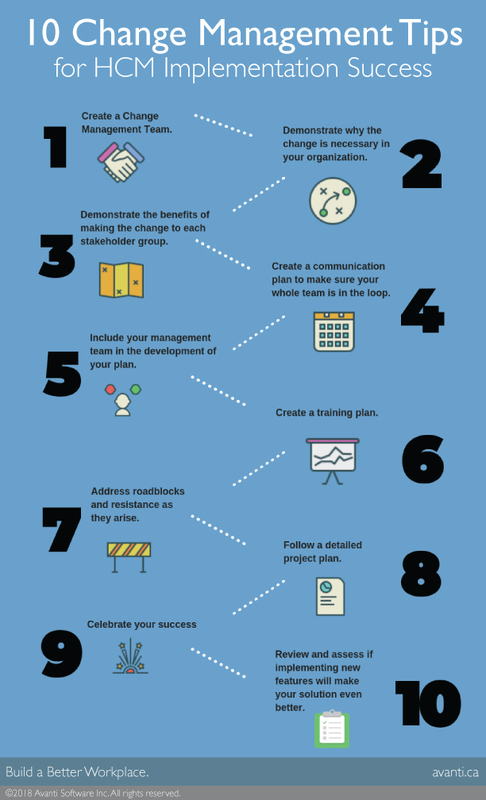 Change Management occurs before you implement a new feature or a full solution. It’s vital to remember that no matter how small a change may be, it is still a change and can be just as difficult to implement. This is why no matter how big or small the change, a change in the workplace requires every individual, team, and manager to help manage it successfully. Know what each of your stakeholder teams need to get out of a new solution or process, you can build these into the implementation and change management process so they will be excited about what they will gain from the change that is coming. Here are some examples of stakeholders and what they are often interested in when adding to or changing an HCM solution. For the executive team, their interests lie in ROI, gaining efficiencies, retaining talent, and reporting that helps with their decision-making. For finance, it is being able to understand labour costs, and easily report on them, understand benefit costs, request test scenarios to understand how new union agreement or benefit plan will impact costs and to get reports easily on areas such as turnover. Payroll is interested in streamlining time-consuming processes and eliminating manual spreadsheets and input. This includes automating complicated formulas, quick access to employee information like benefits and time-off, and not having to duplicate entry or waiting for data to be pushed from another solution. Managers are looking for tools that take some of the administration out of their day to day responsibilities, allowing them to complete employee-related tasks quickly and easily. Employees are often not consulted when new solutions are chosen, but we recommend surveying them as it’s important to understand what they would like so that they will adopt it quickly when you are ready to roll out a new system. Once you have your stakeholders and their needs you can start working on your change management plan. This team needs to be responsible for communications to all stakeholders, listening to concerns and working to ensure a smooth transition to the new solution. Build a team that consists of people from across your organization who will be champions of change. It’s important to include a change sponsor at the senior executive level. 2. Demonstrate why the change is necessary in your organization to share your business strategy for making a system change. Being able to communicate to your whole organization the factors that led to the decision change, such as information gaps, new technology, growth, and any other contributing factors will ensure they understand why the change is important to them and to the company. 3. Demonstrate the benefits of making the change to each stakeholder group. Sharing with your whole team how everyone will benefit from the change, such as better reporting for metrics and analysis, improved communications, streamlined processes, and any other benefits. Make sure your team knows how to use their new tools and to ensure they get the most out of the new solution. For your employee team, the training may be as simple as how to navigate Self-Service and enter their time off requests. For your management team, you may need to show them how to complete performance reviews and access departmental labour cost reports. 8. Follow a detailed project plan. Invest the time to build a project plan so everyone knows the timelines and deliverables for the project. This helps with communications and ensures your project stays on track! When you go live, thank everyone, acknowledge the accomplishment, and remind everyone how the new system will make your organization better! 10. As new features are introduced, review them and assess if implementing them will make your solution even better. 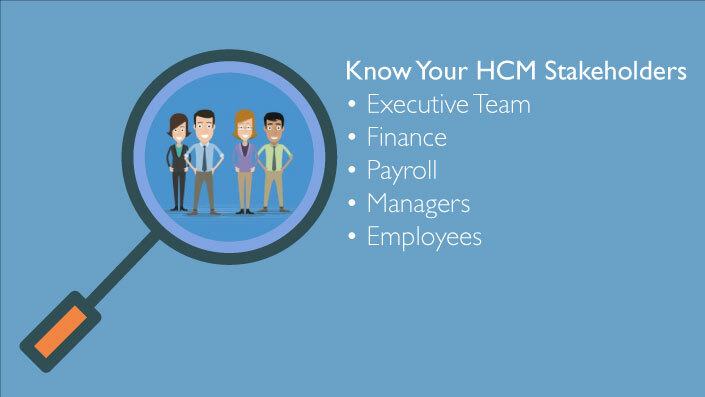 The success of your HCM implementation largely depends on understanding the business needs for each of your stakeholders.